Hi, another GORGEOUS item which is coming in the new Sale-A-Bration release on February 16, 2018 is the Springtime Foils Designer Series Paper. You are going to LOVE these papers. They are stunning! They are a heavy-weight paper with beautiful designs in gold foil, silver foil and rose gold foil. There are three sheets of 4 single-sided designs. I truly wish I could take credit for the card I am sharing today as it is beautiful. It’s a sample in the Sale-A-Bration catalogue. As I always remind you, it is fine to CASE the catalogue or use other designers for inspiration, just remember to give credit where it is due. 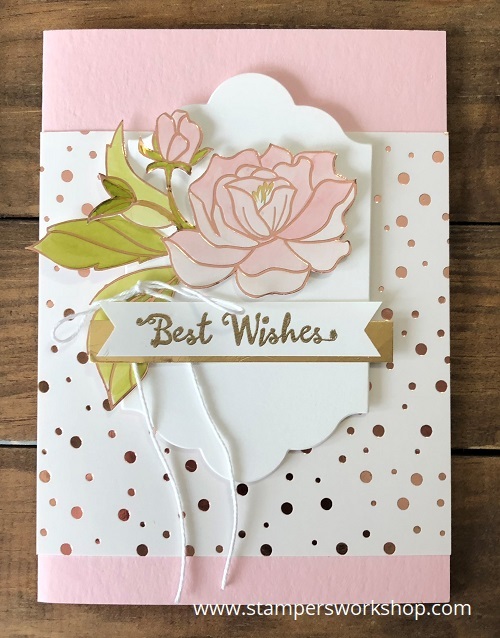 For this card, I used my Stampin’ Blends to colour in flowers and leaves from one of the sheets of the new Springtime Foils Designer Series Paper. I then trimmed the elements out and adhered them, with Stampin’ Dimensionals, to a label cut using the Lots of Labels Framelits Dies. (These are one of my favourite die sets!) I added a sentiment (from the Petal Palette stamp set) which I heat embossed with gold embossing powder before layering on a strip of gold foil paper. A white bow, tied with Whisper White Baker’s Twine, was added to give a little more interest. The base card was made from Pink Pirouette cardstock and a small panel of the rose gold foil paper was adhered to the base. The beautifully decorated panel was then adhered to the top using more Stampin’ Dimensionals. Isn’t this a pretty card!?! I think the original creator is so talented. I think I might have to make a few more to have in my stash! And what do you all think of the Springtime Foils Specialty Designer Series Paper? I know I have only shown a tantalising peek in this post but if you want to see more, check out my most recent Facebook Live post. This is a beautiful card, Kylie, and one I might need to CASE!! The be thrilled to receive it.